Northeastern University researcher Matthew Goodwin gave an IMFAR 2017 keynote speech about his work on "Wearable Sensor-Based Physiological and Physical Activity Biomarkers for Use in Laboratory and Naturalistic Environments to Assess Arousal and Repetitive Motor Movements in Individuals with Autism Spectrum Disorder." 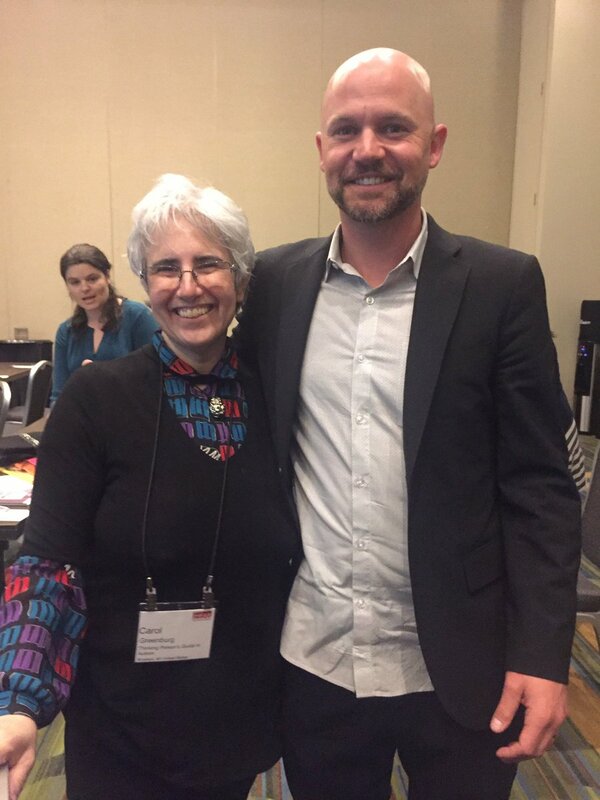 Thinking Person's Guide to Autism's Carol Greenburg and Shannon Rosa, and Autism Women's Network's Corina Becker, spoke to Goodwin after the IMFAR press conference, about the real-life applications of his work, and how they can benefit autistic people. Carol Greenburg: What constitutes a behavior, insofar as it’s something that needs to be mitigated? A behavior like flapping or other “stims” may mean something different to the person who’s doing the intervention, as opposed to the autistic person themselves. What I consider a behavior is different than what you consider a behavior, and therefore the treatment, intervention, or mitigation may differ. Does that make sense? Goodwin: Perfect sense, and philosophically, we’re aligned. It’s actually a pet peeve of mine that in the clinical arenas, we refer to challenging behaviors as “behaviors” with a negative connotation. Because everything we do is a behavior! All the positive things are behaviors. So, A) I wouldn’t define behavior only by negative consequences. And B) I’m actually more interested in determining the function of these behaviors, assuming that they are purposeful and regulatory, and that there’s a reason, and it’s just our failure to understand what that is. Even things like aggressing to other people, or self-injury. I would rather suppose that that is something of a stress response, or a fight-or-flight response, or a panic response, in the absence of being able to cope or communicate with other people than assume it’s oppositional, or defiant. Greenburg: Or of frustration that one is not getting through what is perfectly obvious to the autistic themselves, and cannot express, especially because we often don’t understand that other people are not sharing our definitions, or frame of reference. Goodwin: Correct. And that’s another thing that I like about the physiological measures, is that even when you have a difficult time in articulating to me what might be stressful, or disorganizing, I can record it from your body. I can view it objectively, and I might have a little bit more empathy and compassion for you as a result of that, than assuming you’re not having that issue or because you can’t explain it means that it’s not having some negative consequences. Greenburg: It is a presuming competence issue at its core. Goodwin: Yes. And we live in a social world, with norms, and if those norms are violated, we say, “There’s something wrong, get in line,” instead of thinking “What would the world be like for someone who is neurodivergent, and then trying to think about “How do I interact with that person?” So the neurotypical might adjust their behavior to be more complementary in reaction to someone on the spectrum. Greenburg: The whole idea or norms, it just seems to me that there’s a hierarchy of norms that are important to me, and that hierarchy is radically different for educators, for example, or for professionals, than they are to us as autistics. Goodwin: I’m not interested in trying to shape anybody’s behavior, unless they tell me they want it shaped themselves. Or a parent is saying it is somehow preventing well-being, learning, or independence for their child. Greenburg: Well the question is, whose agenda is it? Is it the parent’s agenda? Is it the child’s agenda? Who is benefiting? Who is writing the subtext here? Goodwin: I agree. I mean, I don’t know if biosensors are going to solve that problem but if it's another source of information to reflect on yourself and share with other people and to think about, I do see value in it. Greenburg: Well, pattern detection is always important and pattern detection is what wearable devices are all about so I can certainly can see great value in that. Goodwin: So you have the FitBit. Greenburg: I’m surprised that my heart rate is so low. At IMFAR, in this conversation. Goodwin: So let’s see if it’s different -- I’m at 77, where are you at? Greenburg: I’m at a mere 69. Goodwin: not that far out. Greenburg: Mine should be topping 100, given how I feel. Goodwin: Do you track how many steps you take? Do you track what your heart rate is doing periodically? Greenburg: I track how many steps I’m taking. I track my heart rate more because I want to see how upset I am compared to how upset I was before what I was feeling. Goodwin: Fantastic. So you’re getting some self-insight and self-awareness. Greenburg: I am using my FitBit for feedback on aspects of my autism, specifically. I also use the meditation function when I start to feel myself hyperventilating. I meditate quite a bit and so I’m able to use it and it’s an invisible way to meditate and self-soothe without doing anything that will necessarily draw attention to me, at a time when it would not be practical for me to draw attention to myself. So instead of rocking or stimming or doing something else while I’m starting to get overloaded I can trigger this and it’s an invisible way of my self-regulating. Goodwin: You should come work for me. You said that better than I could have said that. Greenburg: How much are you paying? Shannon Rosa: We actually did get questions at Thinking Person’s Guide to Autism on Twitter, when you mentioned alexithymia, asking, “what can I do? How can I do it?” It sounds actually, Carol, like you just explained what people can do. Goodwin: So here’s where I really would love to learn from your community about the ways that you're using this so that we can provide it to people who can't afford it or have not thought about using it. I mean it's one thing that I can give you that, but the sensor itself is not enough. You have to then take that information and turn it into meaning. Rosa: Right. Tools are tools. Corina Becker: I don’t know how usable it is nowadays, but I had an idea a couple years back of developing an app that was basically an alarm system for an autistic person to self check themselves on how they’re feeling. Rosa: There’s an education point of this regular FitBit that needs to be adapted. Rosa: That would be amazing. Goodwin: We’re working on that. We really are trying to build that. Becker: A FitBit version of a five point scale, in the beginning at least. How anxious am I? And from there if it could give me a script, that would be really helpful. It was a very simple app, it was this script: check list of here's what I'm feeling, here are my symptoms, go. Rosa: Carol and I are both parents of very high support young autistic men and I've been texting my son’s teacher about his regulation throughout the press conference. Goodwin: Great way of saying that. Rosa: High support? We’ve been working on that phrasing for a long time. Goodwin: It’s good terminology. I say severely impacted but that still feels a little pejorative. Greenburg: Severe. Severity equals, in my experience, how obvious it is to non-autistics which has limited value to actual autistics. Goodwin: Yeah, great point. I’ve never heard it phrased in terms of support needs. Rosa: That’s the language that we try use. Goodwin: Great. I’ll try to do that. Rosa: Yay! We can go on now. Greenburg: We've reached one person! Rosa: I would like to hear more about what kind of outcomes have you seen so far in being able to support people. In high support people, or people with communication disabilities? Have you been able to determine thresholds? Have you seen actual success in being able to detect when people were getting aroused before it would typically happen without your system? Goodwin: Yes. So for the challenging behavior, the aggression to other people, very concretely, in inpatient units, we’re finding that the biosensor data is predictive of an event about a minute before it happens. Rosa: Wow, it’s like an early earthquake system, right? Rosa: It’s actually better because I think they only have earthquakes up to seven seconds now. Goodwin: Part of what we need to do is try to increase the accuracy of the prediction and give more time to give the warning so there’s more time to prepare for it. But I think as we get more data and there’s more signal processing of that data we might be able to do that. Greenburg: What I’m wondering is what would that warning look like to the professional? In other words, it’s a very different thing to say, “okay, I’m getting a warning that there’s about to be something happening.” If that’s an actual aggression, if somebody’s going to come up and hit you, it’s useful to know so you can duck. But there’s a way in which it has to be more qualitative. It’s not just that something is coming. What is it that’s coming? Goodwin: And what should we do about it? Greenburg: And what should we do about it that will most benefit the autistic person, once again, and not necessarily benefit my ability to control the autistic person’s behavior. That’s another underlying philosophical issue. Goodwin: I agree. I mean, we’re just alerting. So then the next phase is stakeholder groups. So, you being the autistic person, your people who care about you and who you’ve agreed to have care for you on your behalf—what’s effective for each of those stakeholders in that situation? Becker: I want you guys to get scripts. Scripts are really helpful! Goodwin: They’re like safe words, right? Becker: Yeah, they are like safe words. They are very easy to memorize. I don’t speak as well as I appear to speak because I spend most of my life scripting. Scripts would be very, very helpful to you. Every time the alarm goes off for X thing that’s coming up, if you have a script of how to respond to me quickly, then that’s going to be very helpful to me. Greenburg: Even a routine. You know this is happening, okay this needs to happen in order to at least decrease the severity or at least help get into position. That would help. Rosa: We’ve been doing workshops with developmental pediatricians and also autistic people who work in high support young adult groups, on understanding autism and aggression—including potential medical reasons. My concern, and one of the things they talked about, is that sometimes when behaviors decrease and so are "mitigated" from the carer or family member’s perspective, that actually means that the autistic individual is sick or unwell. So I think there are a lot of ethical issues. Greenburg: I don’t want to be mitigating when my son is already in distress. This is something I don’t want to be mitigating. I want to clarify. Goodwin: Yes, or some seizures, or gastrointestinal pain, or reflux, or some aversive sound in the environment that nobody else is having a response to. I mean… all I can tell you is the physiology is changing and there’s an association between physiology and behavior. What in the environment is changing the physiology and what the individual and their supports can do about it, that I can’t predict. I'm angry about the sudden popularity of fidget spinners, but probably not for the reasons you think. I'm not mad that they're disruptive in class, or obnoxiously trendy. I'm furious because of what they reveal about societal power structures, and the pathologizing of disabled people by non-disabled persons. Autistic people (and others with developmental disabilities) have been fighting a war for decades. It's a war against being forcibly, often brutally, conditioned to behave more like neurotypicals, no matter the cost to our own comfort, safety, and sanity. And those of us who need to stim in order to concentrate (usually by performing small, repetitive behaviors like, oh I don't know, spinning something) have endured decades of "Quiet Hands" protocols, of being sent to the principal's office for fidgeting, of being told "put that down/stop that and pay attention!," when we are in fact doing the very thing that allows us to pay attention instead of being horribly distracted by a million other discomforts such as buzzing lights and scratchy clothing. We've had our hands slapped and our comfort objects confiscated. We've been made to sit on our hands. We've been tied down. Yes, disabled children get restrained—physically restrained—in classrooms and therapy sessions and many other settings, for doing something that has now become a massive fad. Think about this: Decades of emotional punishment, physical violence, and other abuses. 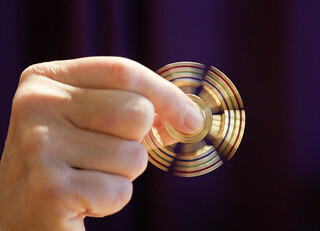 And then some guy (who just happens to be in a position with more social clout than most disabled people will ever attain) writes an article about how having a fidget toy helps him concentrate during meetings, and all of a sudden, every neurotypical person in America is falling all over themselves to get a fidget toy of their own. The first time I heard about the fidget spinner craze on the news, I wasn't sure whether to laugh or cry. But I was leaning toward "cry," for the reasons I just explained, and because the irony made me feel ill. Sometimes the universe has a cruel sense of humor. This is important. Really important, so read this next sentence twice: Something that was considered entirely pathological and in dire need of correction when done by disabled people is now perfectly acceptable because it is being done by non-disabled people. This should make you stop and think, especially if you are someone who works with, educates, or researches people with diagnoses like autism. What else might we de-pathologize overnight once the "right" people, the "normal" people, the "healthy" people start doing it? Will somebody write a tweet that makes it socially acceptable to avoid eye contact? Will a Facebook meme make it suddenly trendy to have texture sensitivities? Will hand-flapping become cool after it shows up in a music video? Normality is an illusion. It doesn't exist. Human culture is constantly changing, and our everyday behaviors are changing with it, more than ever in the fast-paced digital age (yeah, I'm old enough to remember when phones couldn't go everywhere with you, and believe me, social norms were very different back then). Even if "normal" did exist, setting it as the goal towards which disabled people should strive is unacceptable. Because insisting that disabled people act more like non-disabled people is not about improving functionality, it's about who has the power to set social standards. It's the same reason certain accents and dialects are considered less "educated" and the people who speak that way snubbed. It's the same reason people with one skin tone are portrayed as less capable, or more dangerous, than people with the majority's skin tone. It's​ why "women's work" is devalued and underpaid. In short, it's oppression, plain and simple. Perhaps I should be more hopeful. Perhaps we're moving towards an era of acceptance. Even before the fidget spinner hit the spotlight, more and more professionals have agreed that sensory needs are real, and should be acknowledged and met. Many websites now sell chewy toys, app stores abound with sensory relaxation apps, and plenty of autism "treatment" programs (though certainly not all) have moved away from their prior focus on sitting still with immobilized hands while grudgingly accepted that stimming is actually a perfectly healthy thing for autistic people to do. But the power structure is still there. There's still a rigid hierarchy of who gets to decide which behaviors are normal or pathological. There's still a societal subtext that tells people who are different "be less like yourself and more like us." We need to work on that. Me enoja la repentina popularidad de los Spinners, pero probablemente no por la razón que creen. No me enoja que sean disruptivos en clase, o que estén tan de moda que resulta molesto. Me enfurece por lo que revela acerca de las estructuras sociales de poder, y la patologización de personas discapacitadas [sic] por parte de personas no discapacitadas. Las personas autistas, y otras con discapacidades de desarrollo, han estado librando una guerra durante décadas. Es una guerra contra el hecho de que se nos condiciona a la fuerza, frecuentemente de manera brutal, a comportarnos más como las personas neurotípicas, sin importar el costo para nuestra comodidad, seguridad, y salud. Y quienes necesitamos estímulos para concentrarnos (en general con comportamientos pequeños y repetitivos, tales como, digamos, hacer girar [spin] algo) hemos sufrido décadas de protocolos de “Manos quietas”, o que nos envíen a la oficina del director por movernos, o que nos digan “¡dejá eso/pará de hacer eso y prestá atención!”, cuando de hecho estamos haciendo precisamente aquello que nos permite prestar atención en lugar de estar horriblemente distraídxs por millones de otras molestias como luces que titilan o ropas frotando. Nos pegaron en las manos, nos confiscaron los objetos que nos ayudaban. Nos obligaron a sentarnos sobre nuestras manos. Nos ataron. Sí, a lxs chicxs discapacitadxs se les ata -físicamente- en el aula, en las sesiones de terapia, y en muchos otros lugares, por hacer algo que ahora es una moda masiva. Piensen en esto: décadas de castigo psicológico, violencia física, y otros abusos. Y después un tipo cualquiera (que casualmente está en una posición con más influencia social que la que podrían llegar a tener la mayoría de las personas discapacitadas en sus vidas) escribe un artículo sobre cómo tener un juego para mover las manos le ayuda a concentrarse durante las reuniones, y de repente todas las personas neurotípicas en Estados Unidos se están desviviendo para tener su propio juego. La primera vez que escuché de esta locura por el Spinner en las noticias, no sabía si reir o llorar. Pero me inclinaba a “llorar”, por las razones que acabo de exponer, y porque la ironía me enfermaba. A veces el universo tiene un sentido del humor muy cruel. Esto es importante. Realmente importante, así que lean dos veces la oración que sigue: algo que era considerado completamente patológico y que necesitaba urgentemente ser corregido cuando lo hacían personas discapacitadas, ahora es completamente aceptable porque lo están haciendo personas no discapacitadas. Esto debería hacer que se detengan a reflexionar, especialmente si sos una persona que trabaja con, educa, o investiga acerca de personas con diagnósticos tales como el autismo. ¿Qué otra cosa podríamos depatologizar de la noche a la mañana, una vez que empiece a hacerlo la gente “correcta”, la gente “normal”, la gente “sana”? ¿Alguien va a publicar un tweet que haga socialmente aceptable el hecho de evitar contacto visual? ¿Va a venir un meme de Facebook para que esté repentinamente de moda tener sensibilidad a las texturas? ¿Golpear las manos va a ser cool tras aparecer en un video musical? La normalidad es una ilusión. No existe. La cultura humana está en permanente cambio, y nuestros comportamientos cotidianos cambian con ella, más rápido que nunca en esta era digital acelerada (sí, soy lo suficientemente vieja como para recordar cuando los teléfonos no podían ir a todos lados con unx, y créanme, las normas sociales eran muy distintas en esa época). Incluso si existiera lo “normal”, establecerlo como el objetivo hacia el que deberían luchar las personas discapacitadas es inaceptable. Porque insistir en que la gente discapacitada se comporte más como la gente no discapacitada no tiene que ver con mejorar la funcionalidad; tiene que ver con quién tiene el poder de establecer los estándares sociales. Es la misma razón por la que ciertos acentos y dialectos se consideran menos “educados” que otros, y se mira mal a la gente que los habla. Es la misma razón por la que a las personas con un cierto tono de piel se las representa como menos capaces, o más peligrosas, que a las personas con el tono de piel de la mayoría. Es el motivo por el cual el “trabajo de mujeres” está devaluado y peor pago. En pocas palabras: es la opresión, pura y simplemente. Quizás debería tener más esperanzas. Quizás estamos avanzando hacia una era de aceptación. Incluso antes de que el Spinner llegara a las primeras planas, cada vez más profesionales concuerdan que las necesidades sensoriales son reales, y que deben ser reconocidas y satisfechas. Ahora hay muchos sitios web que venden juegos para morder, abundan las aplicaciones para relajar los sentidos, y muchos programas de “tratamiento” para el autismo (aunque ciertamente no todos) han dejado de poner el foco en sentarse quietos con las manos inmobilizadas, y han aceptado a regañadientes que la estimulación es algo totalmente saludable para que hagan las personas autistas. Pero la estructura de poder sigue estando allí. Sigue habiendo una jerarquía rígida de quién puede decidir cuáles comportamientos son normales o patológicos. Sigue habiendo un subtexto social que dice a las personas que son diferentes “sé menos como vos, y más como nosotrxs”. Necesitamos resolver eso. Because medical decisions often need to be made in stressful situations, involve complex information, and require weighing of significant risk, planning is important. There are many ways that people with intellectual and developmental disabilities (I/DD) can receive support to make decisions about the health care they want to receive. The following tweets are from a webinar hosted by The Arc National's Center for Future Planning, on supported decision making for people with intellectual and developmental disabilities, both in general, and regarding medical care. The speakers discussed how supported decision making works, why it's a less restrictive option than guardianship, and how people with ID/DD can benefit -- in ways their caregivers and loved ones can get behind. The webinar was conducted by Sam Crane and Kelly Israel from The Autistic Self-Advocacy Network, and Dr. Clarissa Kripke of the UCSF Office of Developmental Primary Care. For more information, see The Center for Future Planning's Resource page on Supporting Daily & Major Life Decisions. Now: Attending webinar on Supported Decision-Making: Planning for Medical Decision-Making, with @Samanticka & @TheArcUS. We have to get past the assumption that an adult with a #disability is a perpetual child. People with ID can make supported decisions. Kripke: Everyone uses experts like lawyers to help them make complicated decisions. Supported decision making for ppl w/ID is no different. Israel: supported decision making is a system that allows the person with #disability to have the final say in their lives. Supported decision making means the person with a #disability has a team of trusted advisers with different kinds of expertise. Supported decision making gets complicated with health care: needing to make calls, manage meds etc. Why support is needed, but with agency. You want to presume competence on the part of the person with DD. Otherwise team of advisors can take over or strong arm decision maker. Supports to help people with developmental disabilities make decisions & sign forms include easy read documents and extra processing times. Under the ADA & ACA, ppl with disabilities have the right to fully informed consent, that includes having someone help you understand forms. While most states do not have supported decision making laws, in all, all you have to do to set someone up 4 SDM is NOT enact guardianship. Informal supported decision making arrangements work. Title II & III of the ADA prohibits medical discrimination against ppl w/disabilities. The ADA requires federally funded medical care providers to provide ppl with #disability with appropriate communication supports. Note: Thinking Person's Guide to Autism interviewed Dr. Kripke recently about Why Supported Decision Making Is a Better Choice Than Conservatorship. Kripke: supported decision making understands that capacity of decision makers with DD can fluctuate depending on environment. Kripke: supported decision making is not coercion. SDM means person is included, coercion means they’re begin forced or bullied. Even if someone has never made a decision before, supporters need to keep trying to support them to be able to engage in decision making. Kripke: We need to remember that people don’t learn to make decisions or communicate in one interaction. It can take time to learn. We need to be patient & give ppls with disabilities the time to respond, and process. Can’t put ppl on the spot for complicated decisions. Supporters have to understand : Making decisions involves taking risks. We also need to reside ppl’s boundaries, take their “no” seriously. Non-cooperation or refusal to participate doesn’t necessarily mean “no”; can mean confusion, fear, involuntary movements. Also: Supported decision maker may change their minds over time. Understanding this is also part of presuming competence. PWD have a right to maximize their potential, and so do family members/supporters. All must clarify when supports/compromise needed. Note: PWD who have had a lot of compliance training may need extra supports to feel comfortable making decisions with agency. A DNR for a PWD can be complicated; doctors and hospitals may not believe a DNR is the PWD’s own wishes. Need legal documentation. Coercion is a real issue with PWD & end of life issues, and people/med professionals making negative assumptions re: PWD’s quality of life.